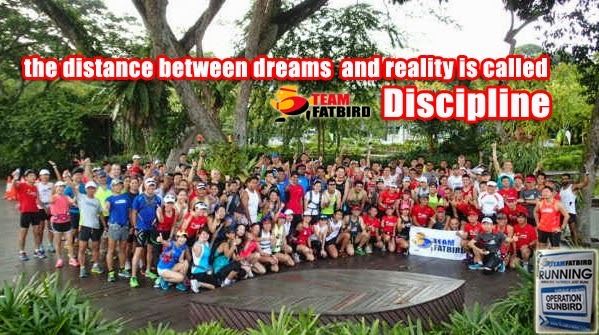 It was the first time for many of the Operation Sunbird trainees at MacRitchie Reservoir Park, the favourite place for Ops Sunbird’s trail and slopes Basebuild training. A number of Sunbirds who were not able to join the inaugural session managed to come down for this 14km and 23km challenge, which many felt a sense of accomplishment after completion of the entire training run. After the honeymoon first session at ‘flattish’ ECP, the Sunbirds were given a treat which they will remember for quite a while, and yet will be thankful for, as it gave all a boost to both physical and mental resilience. The respective pace groups were flagged off at timed intervals to avoid congestion in the Northern Trail. We had a better force of trainers and pacers this morning to help guide the runners through the trails and at various turning points, including setting attainable paces which the trainees could sustain through the entire duration. It was a treat to watch the trainees run in close-knit groups, led by the reliable Sunbird trainers and guides, working in mini teams with mutual encouragement and support, all for a common goal of meeting the morning’s training requirements. And by the end of the 2.5hrs, this Sunbird cohort have shown their mettle by overcoming the trail and slopes challenge with not much of a complaint, and some even going on about how they were pleasantly surprised they have conquered the rather difficult course. The post training debriefs were well conducted by the respective Group ICs, which was beneficial in keeping the large group of participants informed and updated with the latest schedules and training tips. Thanks to the logistics and support team for the post-run hydration and bananas which went a good way towards replenishing the spent bodies. All Sunbird participants went away happy and satisfied, looking forward to a good rest and pampering for the legs, to get them in good shape for next week’s hill training run. the distance between dreams and reality is in the Discipline! Sunbirds Rocked The Trails…Sunbirds Loved The Slopes!